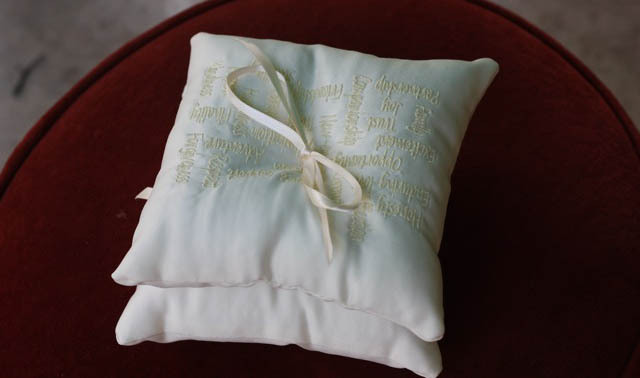 I made these ring-bearer pillows for my brother’s wedding. 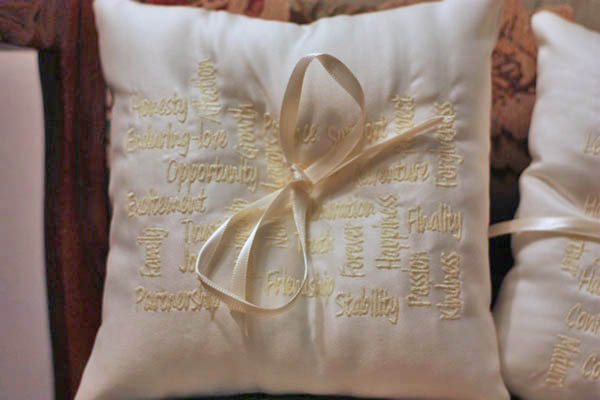 I made the groom’s ring pillow using words his fiancee used to describe him, and the bride’s ring pillow is embroidered with words my brother used to describe the bride-to-be. They are absolutely adorable! My two little boys will be the ring-bearers and each will have a pillow to carry. 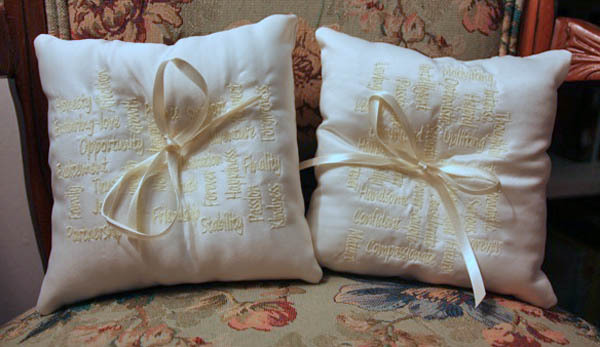 After the wedding, the pillows will be taken apart and matted and framed for a permanent reminder of the bride and groom’s wedding and vows. 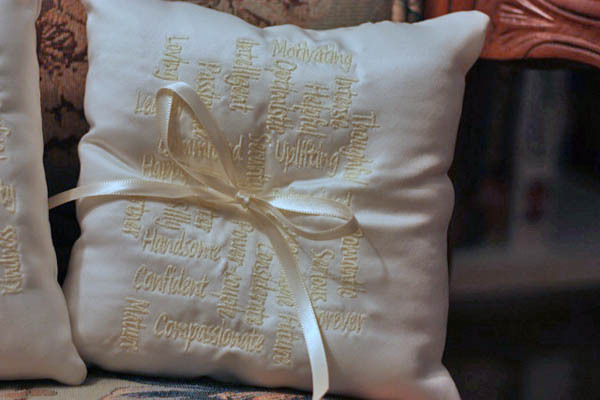 The bridal shower was this weekend and the pillows were all the talk. My brother and his future bride were blown away by these and the idea that we would frame them after the wedding. I used Wordle™ (an free online word cloud generator) to create the graphic I used as guide for arranging the words. I just kept refreshing Wordle™ until I got an arrangement that was pleasing to me. 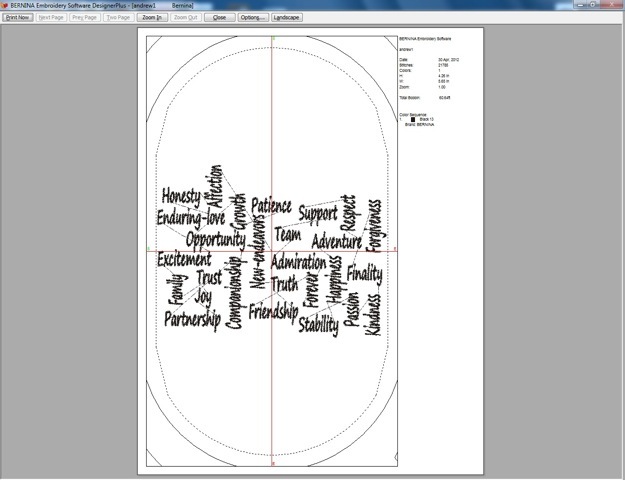 Rather than digitize the Wordle™ file I used a TrueType font to enter the words into BERNINA DesignerPlus Embroidery Software 6. I used the built-in TrueType font Segoe Print set to .40″ or 10 mm and 50% width. The words stitched out beautifully! digitize the words. Beautiful work on the pillows! What a wonderful memory you made. Yes, I used the Wordle as a guide. I just printed it out and kept it next to me for placement.